Six years ago, I was kinda bored and not paying attention in my economics night class at Mission College with Clayton and Judy and created a blog to record all my favorite recipes. The purpose of the blog was to have a place I can quickly access my recipes and be able to recreate the recipes consistently every time I cook. I also wanted to share my recipes to other people and inspire them to learn how to cook as well. Today, I am onto my 100th post on No Limit Cooking! For my 100th post, I wanted to post something special. I picked Ribs. When I started my BBQ club last summer, the number one thing I wanted to learn how to cook and perfect was ribs. 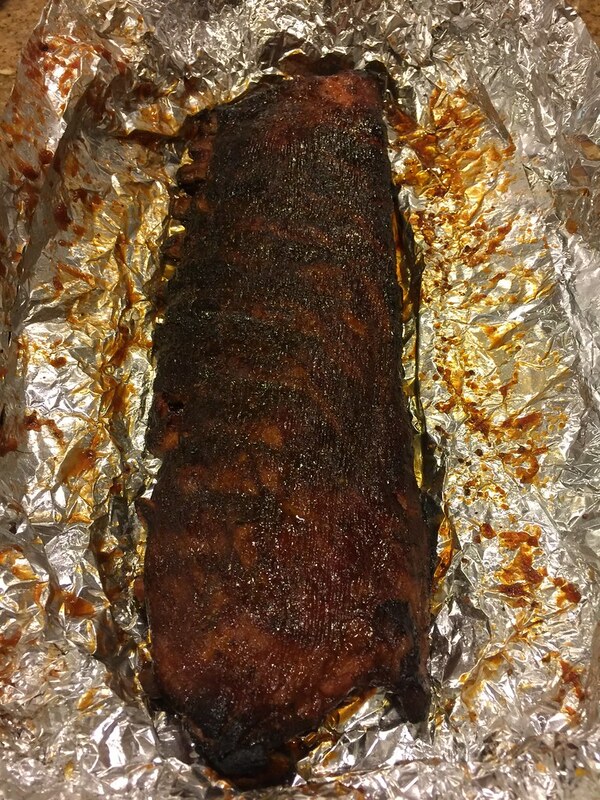 Since last summer, I made ribs six times and think the ribs I made on New Years Eve turned out best. There are so many different variations and techniques for making the “perfect” ribs and it appears that each person online has their own way to create it. This recipe works out great for me and this is what I want to share with all of you. I currently do not have a smoker, but have bought a few accessories to convert my Weber into a smoker. After calibrating and playing around with the settings many times, I figured out the best way to get my Weber to the desired temperature for smoking meat. Since each smoker and grill is different, I recommend that you understand know how to use your grill and/or smoker in order to achieve the desired temperatures for smoking. Prepare No Limit Rub – Preferably in a shaker, combine all the ingredients and shake until combined. Prepare No Limit Honey BBQ Sauce – Combine all the ingredients in a medium sauce pan. Bring ingredients to a boil and simmer for at least an hour. Stir frequently. 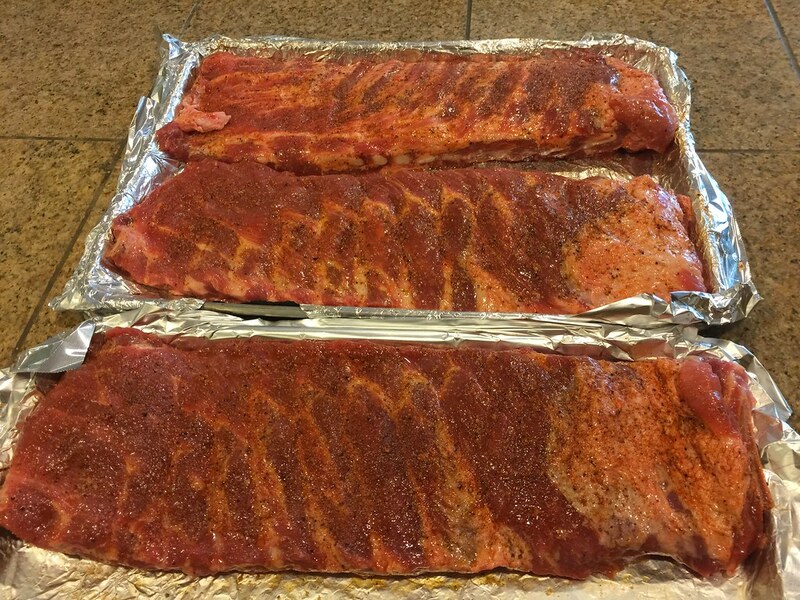 Prepare Ribs – Pat dry and remove membrane on the back of the ribs (or not). Lather each rib rack with oil or mustard. Salt ribs with Kosher salt (1/2 teaspoon per pound) and then generously coat both sides of ribs with rub. 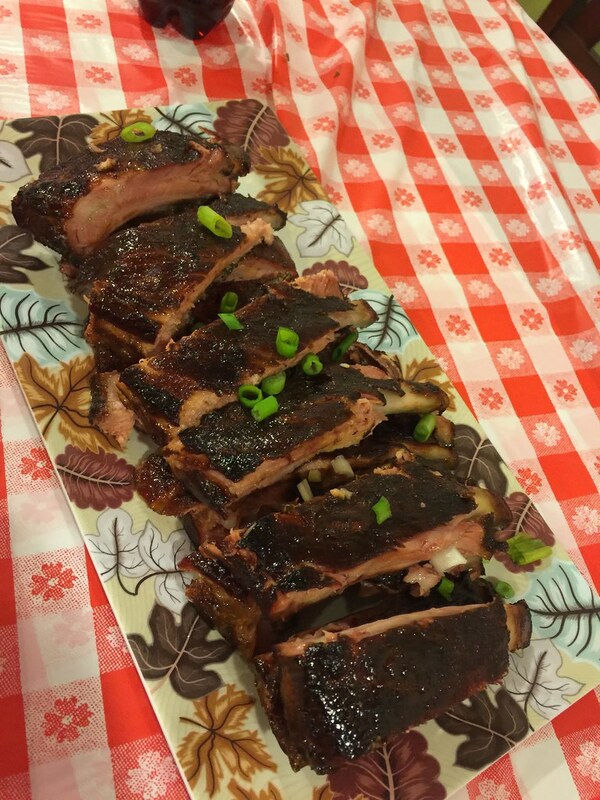 Smoke Ribs – Set your grill or smoker to smoking temperature around 225-250 degrees. Add the wood chunks to the burning charcoal. Add ribs to the smoker. 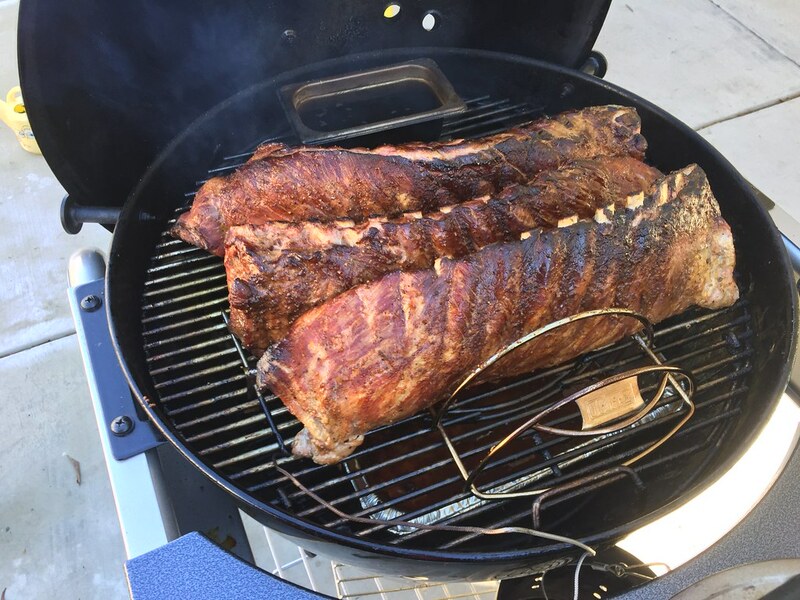 Smoke ribs for 3-4 hours. Rotate ribs as necessary for even cooking. Wrap ribs in aluminum foil and continue smoking for 1 more hour. Remove ribs, open the foil and brush 1-2 layers of BBQ sauce on the ribs. Cook ribs on direct side of grill for 2-3 minutes until the ribs start to sizzle and caramelizes. Remove from grill and wrap loosely in foil for final 30 minutes before cutting the ribs. Check out http://www.amazingribs.com or Youtube videos from BBQPitboys for tips and techniques to get the BBQ to the right temperature. 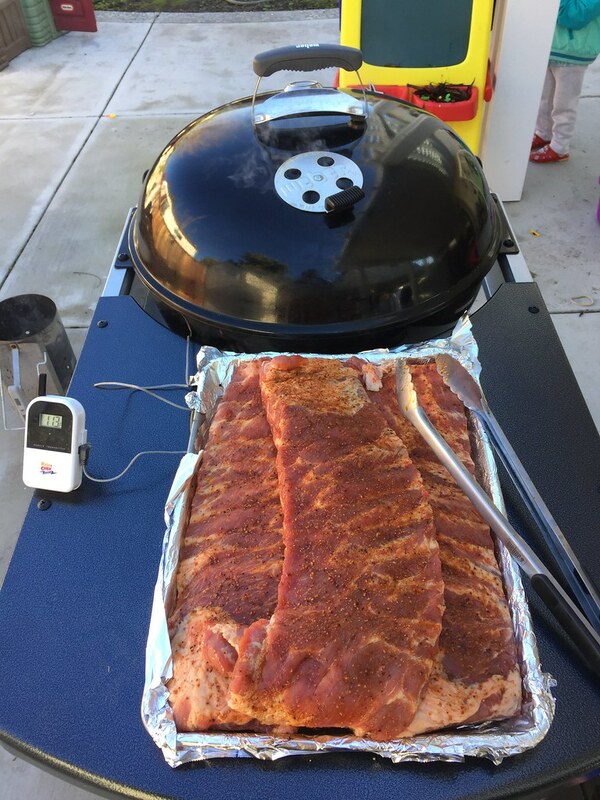 Cooking time varies depending on how many ribs you cook and how you are controlling the temperature. Use a digital thermometer to ensure the grill maintains the 225-250 degree temperature for smoking. You can check to see if the ribs are done by picking up ribs with a pair of thongs and if the meat surface cracks, it’s ready. You can use Baby Back Ribs. Cooking time is a little quicker than St. Louis spareribs. 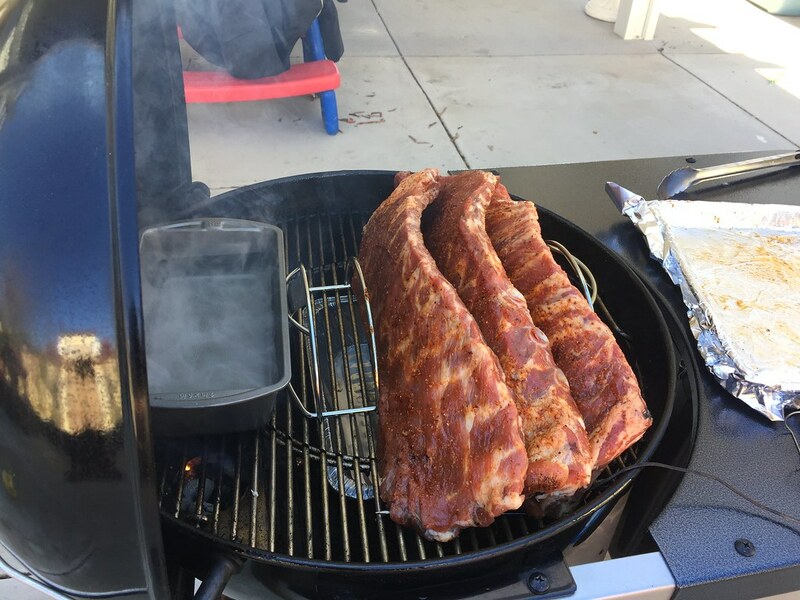 To keep ribs moist during the cook, spray or mop ribs with mixture of apple juice, water, and apple cider vinegar every time you check the ribs. I like to buy my ribs from Costco because the ribs are all cleaned, trimmed, and the membrane in the back of the ribs are already removed. Using wood chunks infuses and gives your meat a much more authentic BBQ flavor. I like to use Oak because that’s the choice of wood many BBQ joints use to smoke their meat.